Household glass cleaners allow consumers to make their homes sparkle and shine with a simple spray and a swipe of a cloth. But what makes the shine possible? 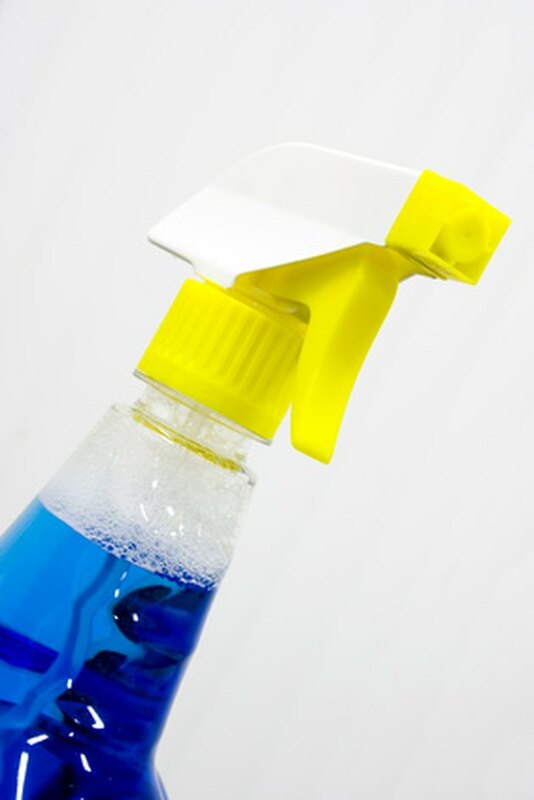 Although household glass cleaners use different ingredients from brand to brand, most manufacturers use three main ingredients in glass cleaners. What exactly makes it effective? Also called rubbing alcohol, isopropanol or dimethyl carbinol, isopropyl alcohol is a key ingredient in glass cleaners, according to experts at Iowa State University. Isopropyl alcohol evaporates quickly and dissolves oil or grease on contact. The International Programme on Chemical Safety notes that isopropyl alcohol is extremely flammable and can be toxic to humans in concentrated doses, targeting specifically the central nervous system, cardiovascular system, liver and kidneys. Monoethanolamine, also called MEA, is a toxic, flammable, corrosive liquid derived from ammonia, according to a technical bulletin from the Huntsman Petrochemical Corporation. Monoethanolamine is an ingredient that many household product companies use in detergents and soaps, as well as cosmetics, hair dye and pharmaceuticals, according to the Household Product Database hosted by the U.S. Department of Health and Human Services. Manufacturers also use it as an intermediate chemical in processes to make rubber or plastic products, and as part of the refining process for natural gas, according to Huntsman. Butyl glycol, also called ethylene glycol butyl ether, or 2-butoxyethanol, is the single most widely produced glycol ether, according to Dow Chemical. Glycol ethers are organic solvents that possess the chemical properties of ether and alcohol in the same molecule. Butyl glycol is a solvent that has a sweet odor; it is the chemical responsible for the sweet smell of glass cleaners like Windex. Household chemical manufacturers use butyl glycol as an ingredient in paints, stains, varnishes and surface coatings, as well as in inks and cleaning products. Excessive exposure is hazardous to humans; butyl glycol that has entered the bloodstream in sufficient amounts will cause red blood cells to collapse.